I've been trying to get my work into some new galleries and I'm very pleased to say that three I approached have said "yes". 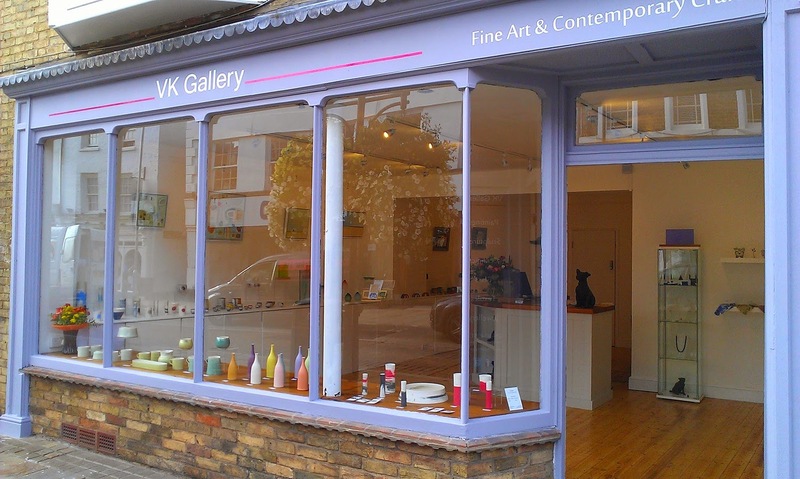 Today I delivered a stack of tea towels to the new VK Gallery in St Ives, Cambridgeshire. It's run by Victoria who has a great eye for design having previously managed Cambridge Contemporary Arts. The things that caught my eye were beautiful paintings by Karen Birchwood, Nikki Monaghan and Liz Toole, plus jewellery by Jonathan Deer and ceramics by Ali Tomlin. 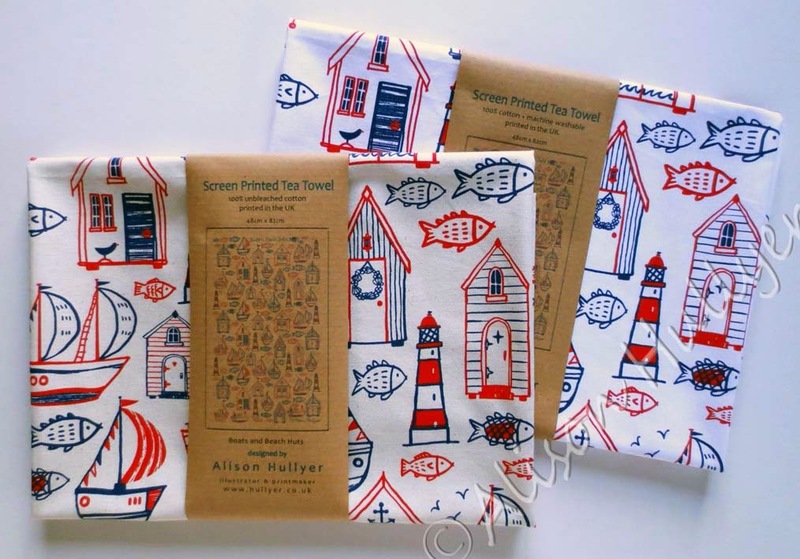 Today I am also sending tea towels to the Gribbin Gallery in Polkerris, Cornwall. We visited the gallery in the summer of 2013. 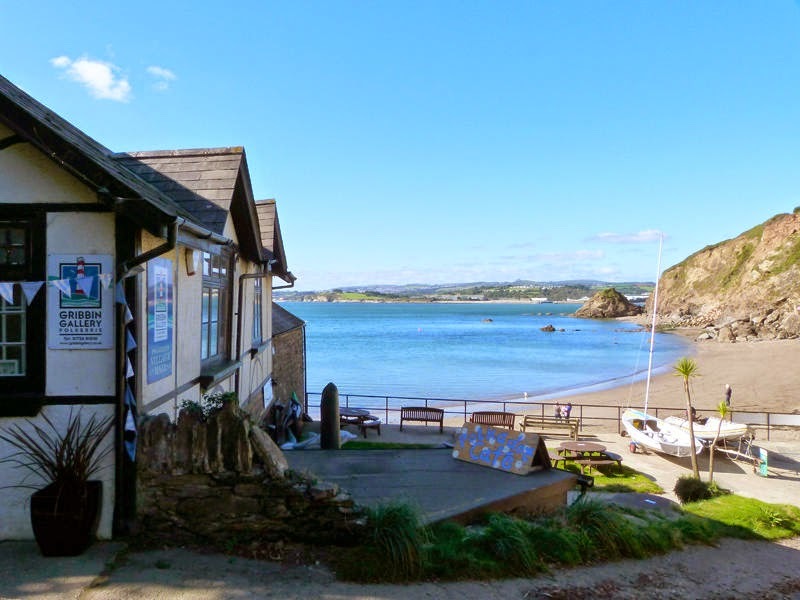 It's a magical spot with a lovely selection of artwork and I hope my sea-side tea towels will be a hit. Next week I will be sorting out some more tea towels to be sent to The Robin's Nest Gallery in Berkshire, along with a selection of my unframed prints. Here is my latest card design published by Phoenix Trading this month. 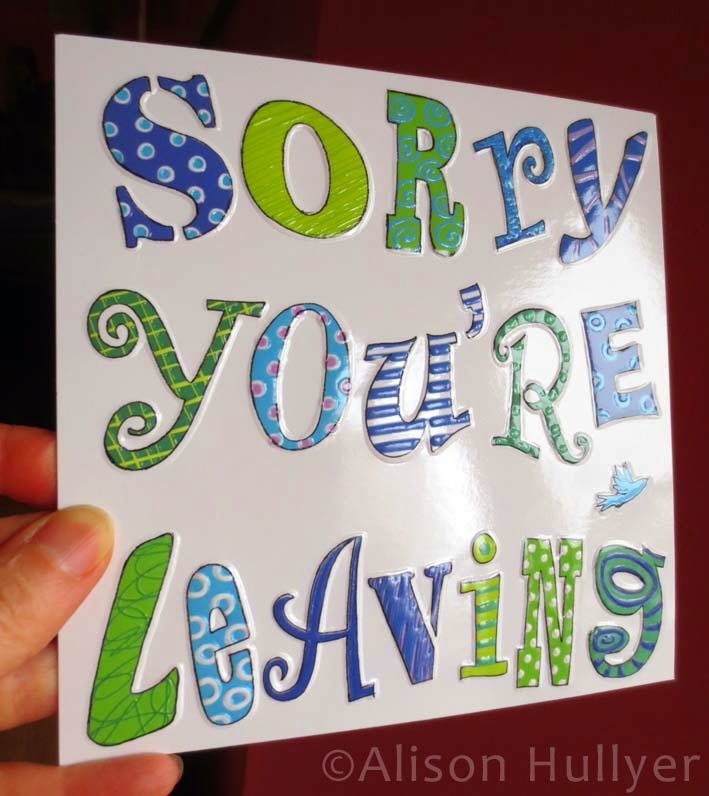 It's 6" x 6" and all the letters are embossed on glossy card. They are are great company to design for and always send their artists some free samples. However it could take me a while to get through these, especially as I don't have any work colleagues. Following on from the Blackbird print, I've been working on some more Bird themed images for a forthcoming exhibition at Cambridge Contemporary Crafts, opening on 1st April. 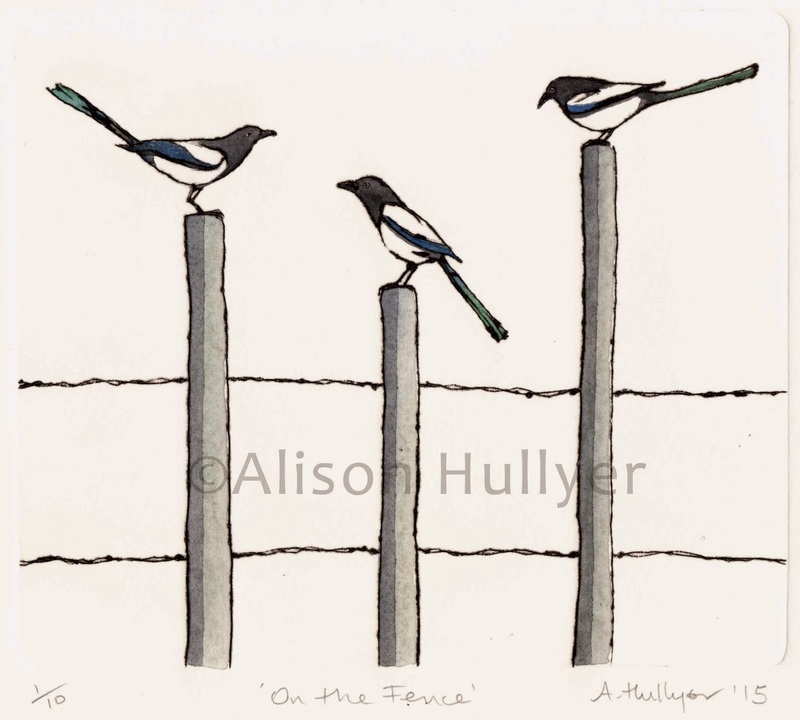 We often have magpies in our garden, their squawking always sets the chickens off clucking even more than usual. I know they are thuggish creatures but I love the subtle colours in their plumage. 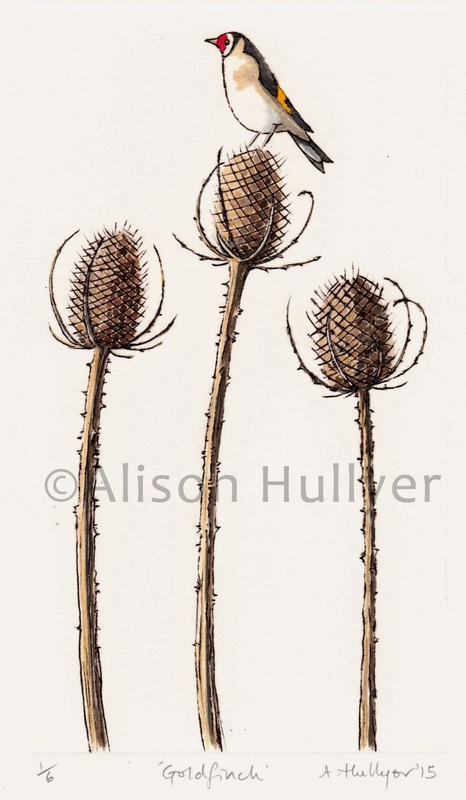 This is an edition of ten, all are hand tinted with watercolour. This Goldfinch was based on a photograph captured by a friend in Milton Country Park. I often see 'charms of goldfinches' whilst out with the dog and love the way this one is so alert from it's vantage point. Editioned at just one of six, as the plate is so fragile. 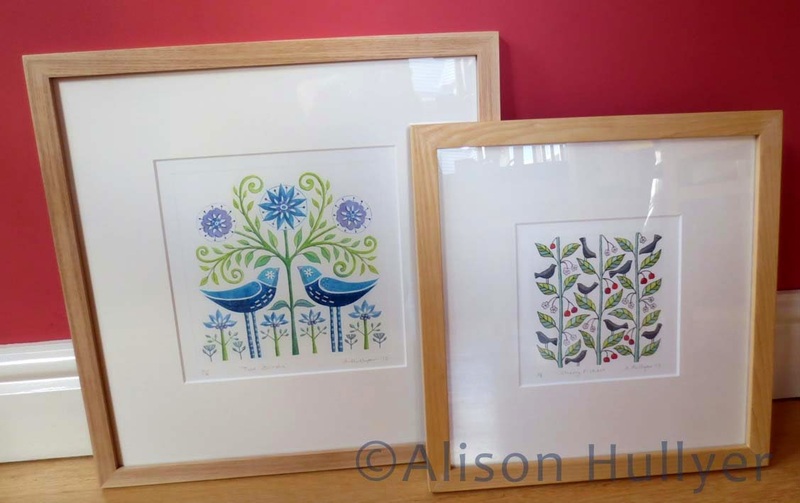 I picked up these two from the framers today. The one on the left, 'Two Birds', is based on an existing coaster design, but has been enlarged and had more detail added. The other is called 'Cherry Pickers' and is a decorative interpretation of blackbirds stripping a cherry tree. They are all hand-pulled drypoints using either perspex or coated cardboard plates.